Martha writes to Abby about the letter Abby sent earlier about gifts to Berry and sorry to hear that she will not be able to gift this year, but they appreciate her gifts so far. Martha goes to write about the Ford Buildings that Mr. Ford has assisted the school with building as well. 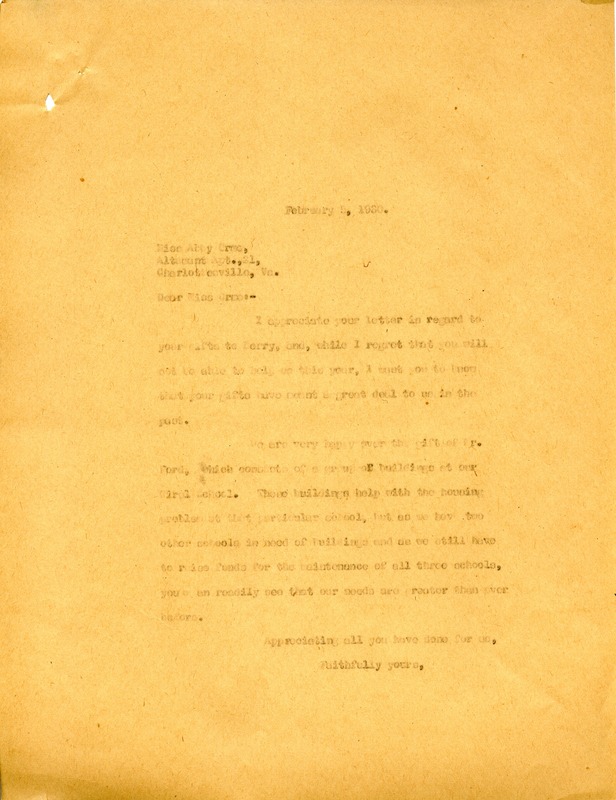 Miss Martha Berry, “Letter to Abby Orme from Martha Berry.” Martha Berry Digital Archive. Eds. Schlitz, Stephanie A., Aaron Jackson, Chelsea Risley, et al. Mount Berry: Berry College, 2014. accessed April 20, 2019, https://mbda.berry.edu/items/show/13600.